Billionaire investor Carl Icahn bought $500 million more in Apple stock, as shares fell. At least one person is happy with Apple's disappointing financial report yesterday -- billionaire investor Carl Icahn, who used a 7% drop in Apple's share price Wednesday to snap up another $500 million worth of the stock. "Just bought $500 mln more $AAPL shares," Icahn tweeted shortly before noon on Tuesday. Wednesday's purchase brought Icahn's currently Apple holdings to roughly $4.1 billion. Apple (AAPL) has a market capitalization of about $465 billion. Apple's stock has fallen precipitously over the past year and a half, as many investors wonder what the company's next big, new product will be. It is the fourth-worst performing stock in CNMoney's Tech 30 index this year. But Icahn has criticized investors for selling the company short. He has a point: Even though analysts expected more, Apple still sold an astounding 51 million iPhones and 26 million iPads last quarter, both of which set new records. Icahn has as history of investing in companies he thinks are undervalued and pushing management for change. Icahn has been buying Apple stock since last summer, and has repeatedly urged the company to put its $158.8 billion stockpile of cash to use by buying back an additional $150 billion of its own stock. That request has fallen on deaf ears. 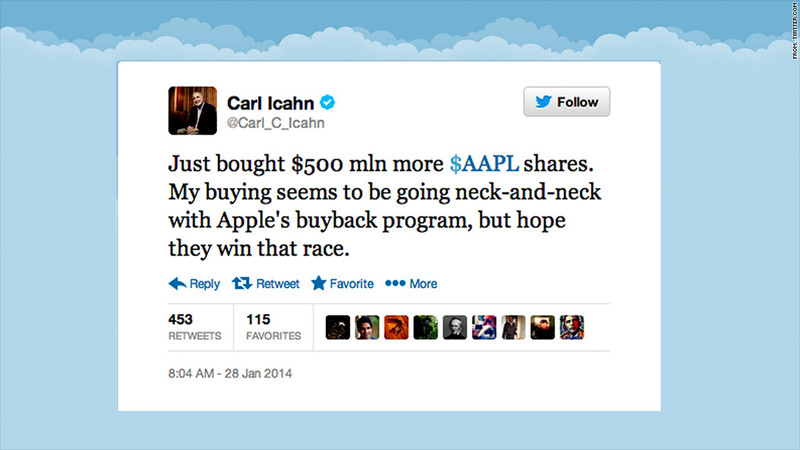 "My buying seems to be going neck-and-neck with Apple's buyback program, but hope they win that race," Icahn included in his tweet. Apple announced a plan in May to return $100 billion to shareholders over three years, through a combination of stock buybacks and a quarterly dividend of $3.05 per share. Apple CEO Tim Cook rejected Icahn's plan to return more of Apple's $147 billion cash hoard to shareholders after a September dinner with Icahn that the investor described as "testy." Icahn has also offered the company unsolicited advice on product development -- advice that some have called naive.